Yes, having rice as a dessert. This rice is even more nutritious than the white rice. It is black in colour, it is sweet and it is sticky. 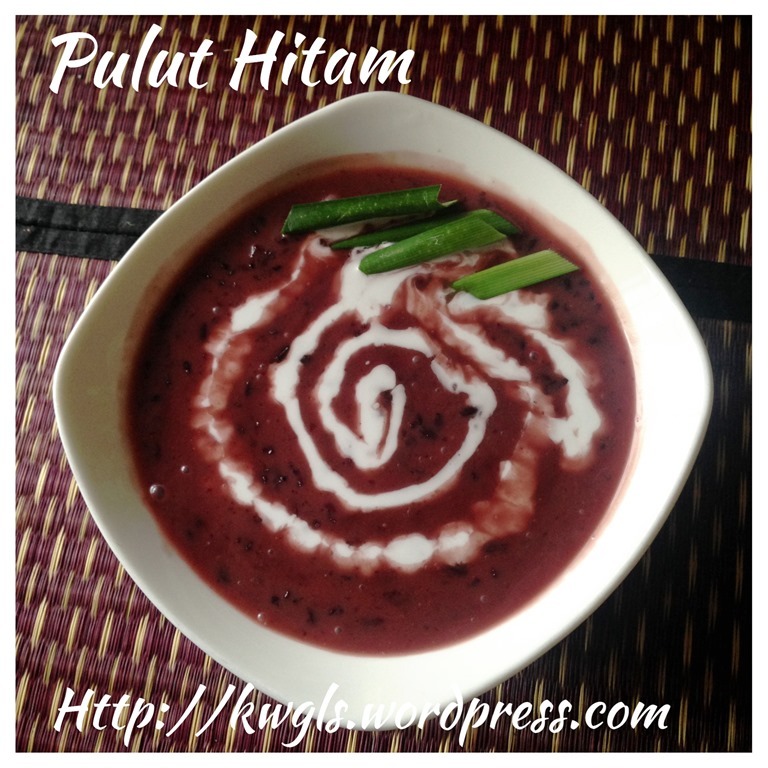 The rice dessert is black glutinous rice porridge which is a popular dessert among the all races in Malaysia and Singapore. 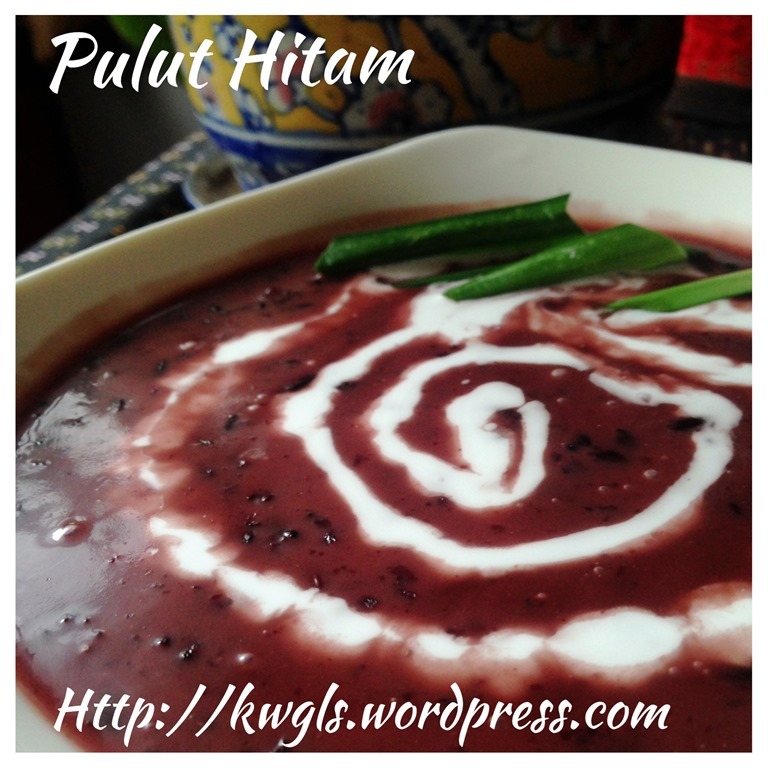 In Malay, it is called “Bubur Pulut Hitam”. 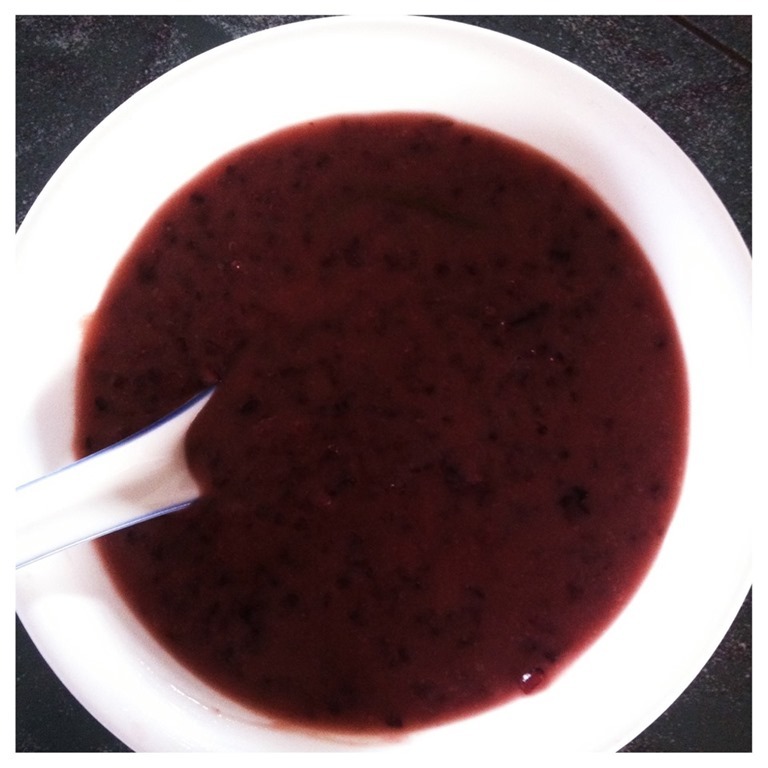 Black glutinous rice porridge (hereinafter refer to as “black glutinous porridge”) is a dessert that I loved since young. In Singapore, I don’t usually cook this dessert as the black glutinous rice that were sold here are mainly from China and Thailand of which its fragrance were different from the glutinous rice from Sarawak. Not many people may know that Sarawak do produce rice and in fact, Sarawak aims to be rice self-sufficient in year 2020. These rice were cultivated mostly by the Iban or Bidayuh tribes in Sarawak. When I was a kid, we were told that the harvest was from the shifting cultivation where forests were burnt in order to plant the rice. However, nowadays, most padi was planted on fixed plot of lands. Beside the black glutinous rice, Sarawak locally produce rice also include brown rice, red rice, white glutinous rice and not forget the famous Bario rice. In recent years, as the Sarawakian became more affluent and health conscious, the shift and focus now is on Sarawak locally pesticide-free produce rice. Two days ago, my mother in law who flew from Kuching gave me 1 kg of the black glutinous rice and I have decided to cook this traditional desserts for my guests and family members yesterday. 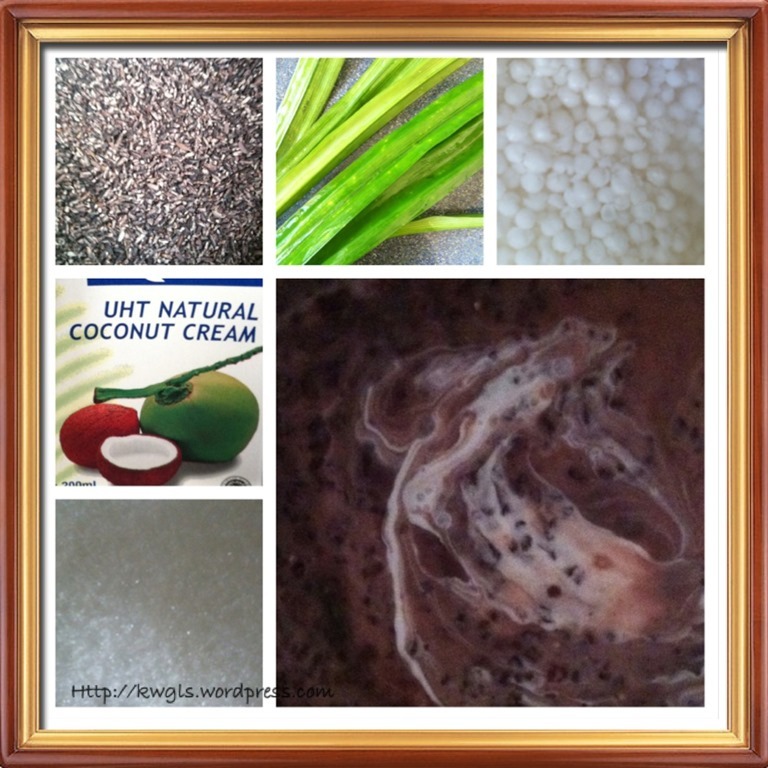 Black glutinous rice porridge is rather easy to cook and the ingredients are minimal. As usual, all the measurement units here are for reference and you can adjust it accordingly to suit your taste. 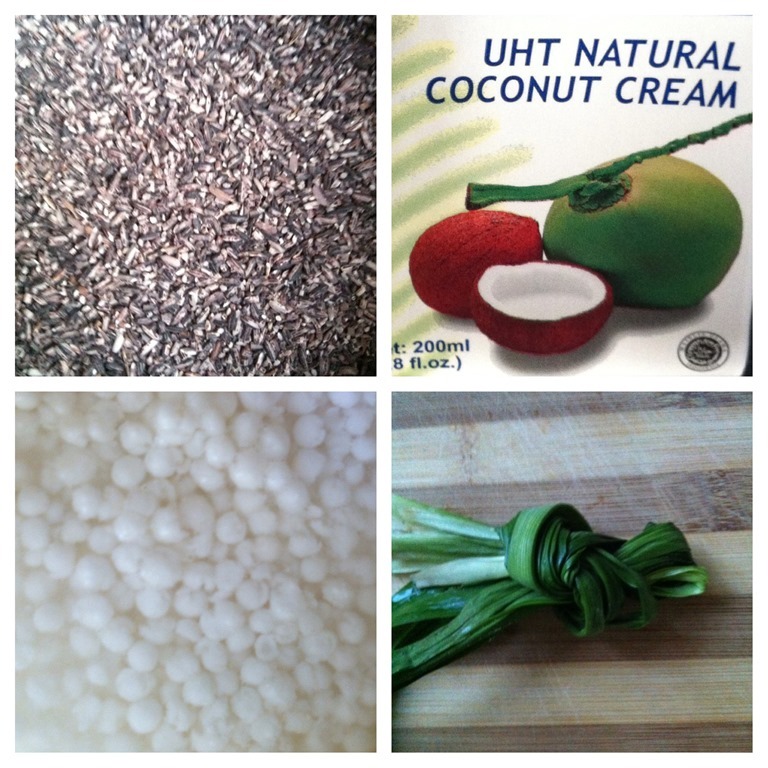 Black Glutinous Rice (2 cups) – Most groceries shops or supermarket would have sold and usually in the dry goods section. Coconut milk (200 ml) – Coconut milk is optional. If you are very health conscious, you can substitute it with evaporated creamer or don’t put any coconut milk at all. The role of coconut milk is to make the porridge creamier. By the same logic, of course cream can also be used. Sago balls (0.25-0.5 cups) –Optional again. Depending on the type of glutinous rice you bought. Some of the rice when cooked are not that sticky of vicious, therefore, adding some sago balls will help to make your dessert smoother. Just soak the sago balls in a cup for one two minutes and you will see that all the balls disappeared. Pandan Leaves (1 bundle) – Optional. Personally, I strongly insisted on putting the Pandan. Pandan and coconut milk are two local ingredients that differentiate our (Malaysian and Singaporean or rather South East Asian Countries’) dessert from others parts of the world. Well, the pictures are rather dull and let’s start cooking. 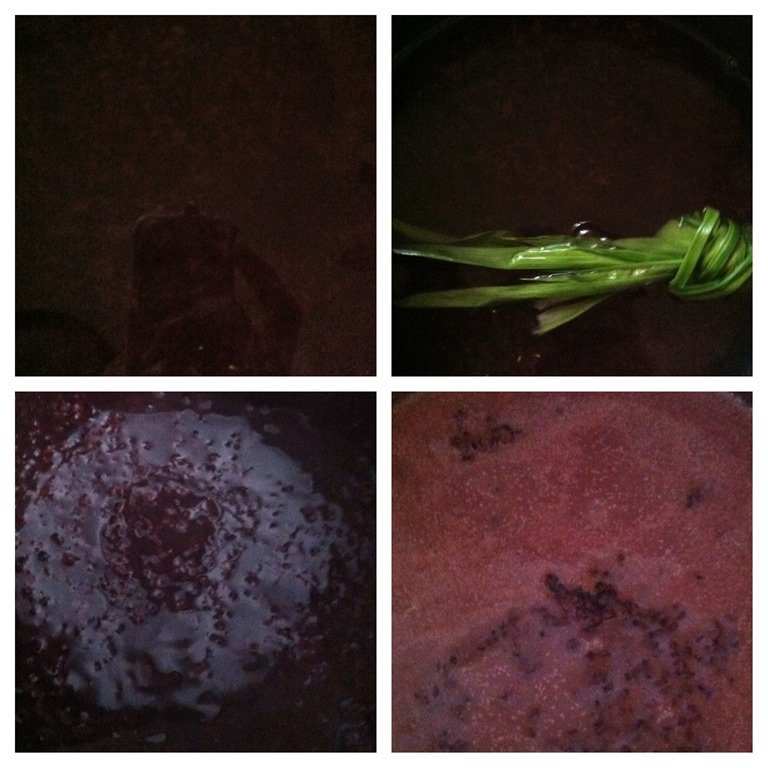 Wash your black glutinous rice in a pot of water. The water should be quite clear but the colour will be dark and become purplish black.. The amount of water should be about 5 times your glutinous rice volume. Well this is an estimated volume and if it too liquid after you complete the cooking, add in more sago balls. If in the process of cooking, you noted that it is overly sticky and difficult to stir, add in more water. Add in pandan leaves and bring to boil over high heat. Once it start to boil, you can switch to medium heat and let it boil for at least 30-45 minutes until the rice are cooked, soft and sticky. At this juncture, you can add in the sago balls and sugar and let it boil for another 15 minutes. If the texture are to your satisfaction (meaning resembles the one that you have ever eaten before), add in coconut milk, pinches of salt and bring to boil and off the fire immediately. Served when hot or cold. Drizzle a few table spoon of coconut milk before serving, if necessary. FRESH COCONUT MILK VS COOKED COCONUT MILK…. Note that I have added the coconut milks before I off the fire and I let it boil for a while. This is the way my mothers used to cook. Most recipes would advised you to drizzle your fresh coconut milk over the cooked dessert. The same applies when you have the dessert in the hawker stalls or posh restaurants. I have to defend my ground that cooked coconut milk are more friendly to your gastro intestinal system and actually, a lot of people are not able to consume raw coconut milk. Secondly, when cooked, the coconut milk blends well with the dessert and easier to keep in the event you can’t finished the dessert. It is rather hard to keep a container of fresh coconut milk in Malaysia and Singapore’s hot weathers. For these two reasons, I will always have my coconut milk cooked in the black glutinous rice dessert and you can see the small bubbles in the dessert. It is funny that you add pinches of salt to a sweet dessert. 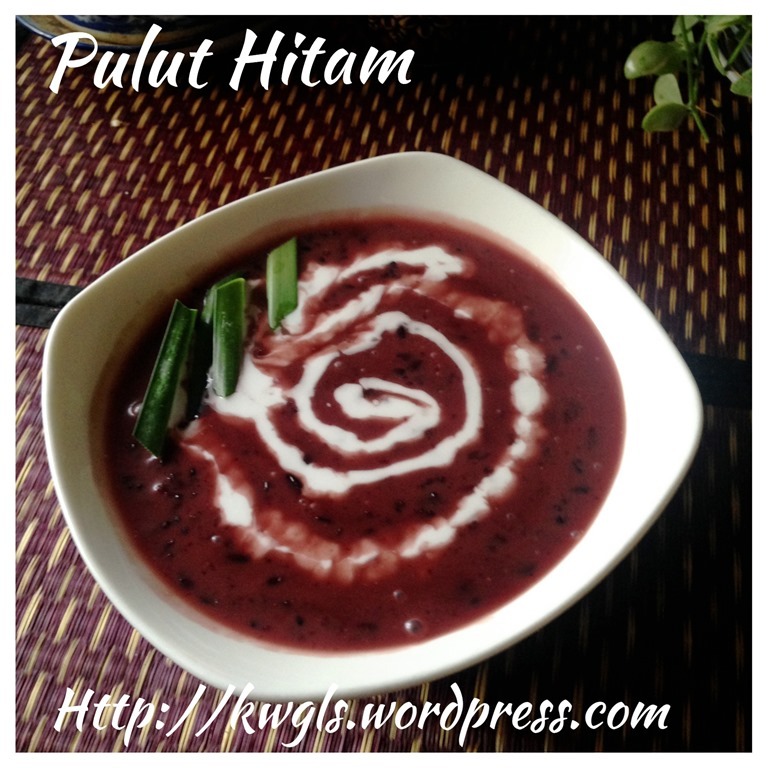 Do you feel very bloated after you have a bowl of coconut creamed based dessert, be it this dessert or other desserts such as Bubur Chacha and rather reluctant to have the second bowl? Well the reason is simple, added pinches of salt will reduce the greasiness and bloated feeling of coconut oil (coconut cream will be come oil when cooked). Glutinous rice are rather difficult to cook. There are three ways you can try. One is the one using open fire as mentioned in my recipe above. Option 2 is using a rice cooker, . For those rice cookers where there are digital menu, select the “glutinous rice” or “porridge” options. In fact, in the picture above, I have selected the porridge option and let it cooked for one round (about 45 minutes also). Well, as not all raw ingredients are the same, in the event that after one round of cooking, your porridge is still not the texture that you are looking for, continue to cook for the second round. Always “visit” them and see how they transformed. You can just off the electricity in the middle of the second round as long as you feel it has been cooked to your preferences. Option 3 is using the slow cooker and let it “slowly cooked” over the night. But look out for the hardening of the top portion, just scope it away before serving. Another way to shorten the cooking time is to soak the glutinous rice in advance for say 2-3 hours and you will be able to shorten the overall cooking by about half. But don’t throw away the water that you soaked, all the vitamins and minerals are there. Just use the same pot that you soak the glutinous rice for the cooking. This way of cooking will shorten the timing significantly. 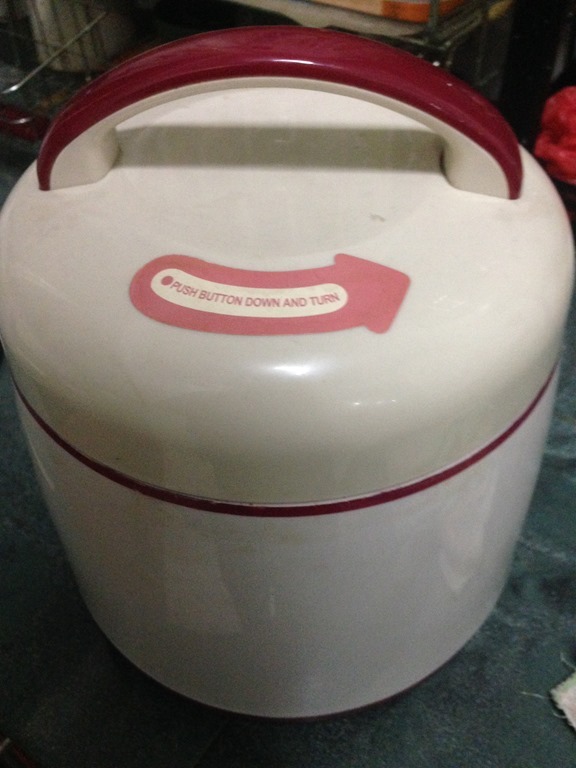 Wash your rice, add adequate water, transfer to the thermal pot. Heat the stainless steel inner pot on the stove, bring the porridge to boil (depending on size of pot – about 10-15 minutes), close the inner lid, transfer immediately to the thermal pot. Close the outer lid and let it sit in the pot for at least 5-6 hours. For this illustration, I cooked this at 8pm and serve my glutinous rice at 7 am the next morning. In the morning, add sugar and coconut milk before serving. 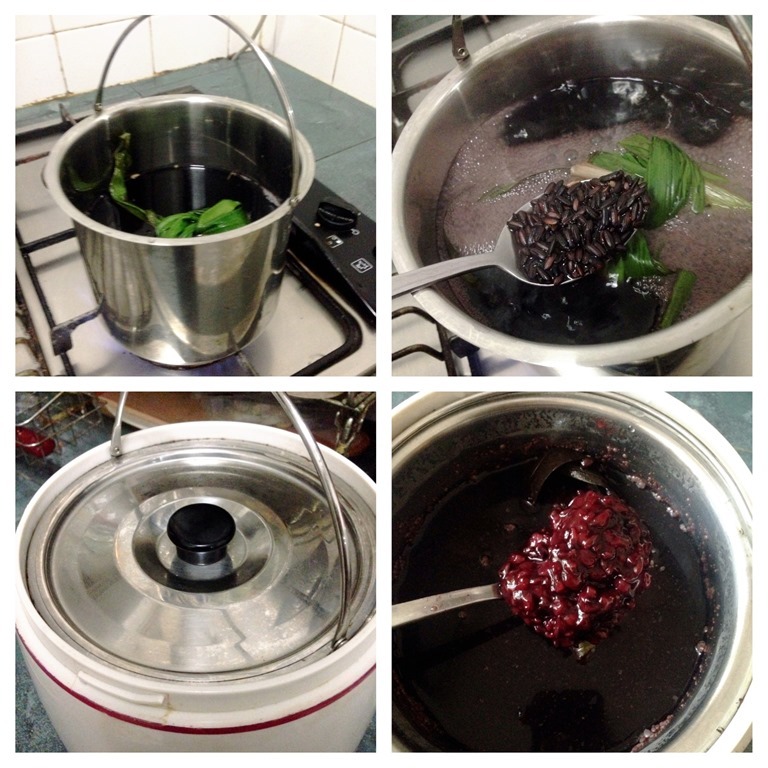 One of the main advantage of this method is the pot is very easy to wash as there are no boiling required. Unless other method, it can be quite a mess to wash the utensils. Black rice contain high level of antioxidants anthocyanin and is even higher than blueberries! Black rice assists in weight loss! Black rice is low in calorie content and made up of mostly of carbohydrates. One may questioned is it not these two statements are contradictory. Food high in carbohydrates are easier to make you full and does not mean that it is high in calorie content. Therefore eating a small bowl of black rice will make you full faster rather than eating a bowl of ice cream! Black rice for diabetics. Black rice contains low quantities of sugar and also contains beneficial plant compounds and fibre which are known to protect the body from diabetes and cancers. 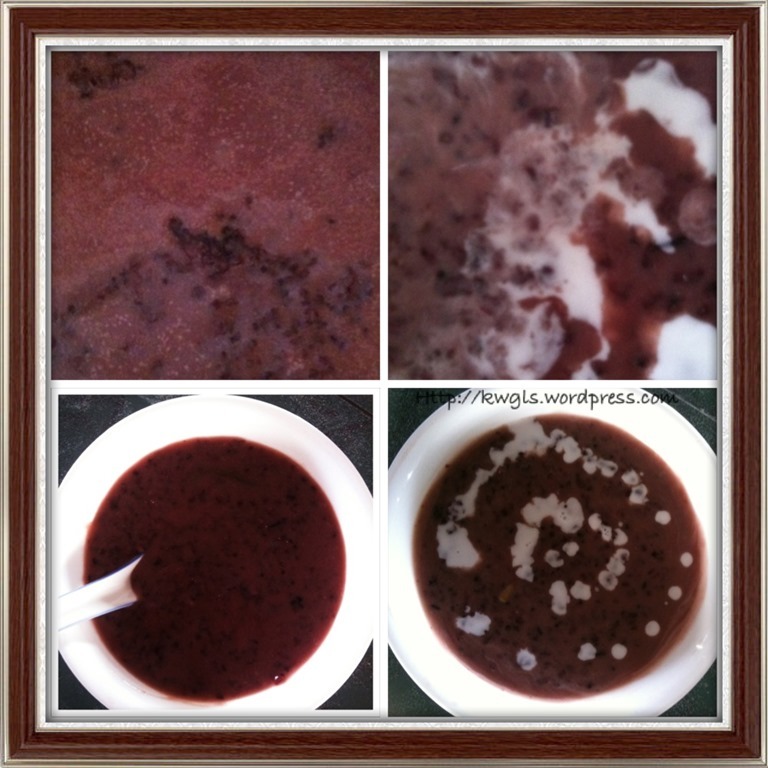 Black glutinous rice pudding is an easy but time consuming dessert to prepare. It is high in nutritional value and there is no fix and fast rule that the dessert will have to prepared in a certain prescribed manner. So, you should be proud of your own version and share with us. The purpose of this post is not only sharing with readers my style of preparing this dessert, but more importantly, to create an awareness of its nutritional values and share some “tips” that it might be of interest to you. No matter how delicious and delicious this dessert is to you, moderation is still the key! Consideration has to be taken about its high sugar level content and the fact that glutinous rice is rather unfriendly to our gastro intestinal system, Therefore, eat moderately with caution! For readers who are not residing in the South East Asia Region, you should be able to enjoy it in Malaysian, Singaporean or Indonesian restaurants. But keep it in your notes as a “must try” dessert when you visit the region! 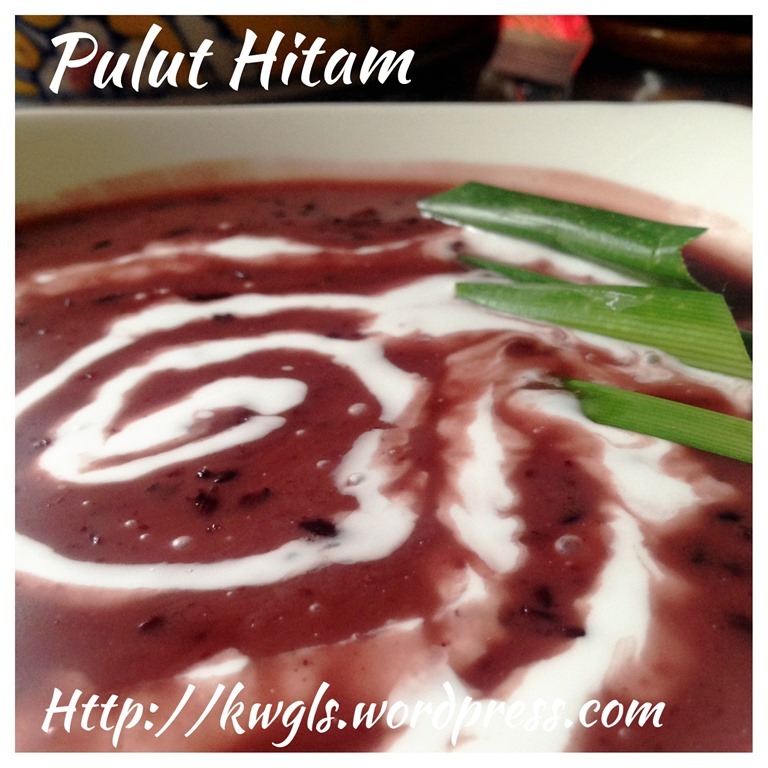 This entry was posted in Desserts, Food Preparation Series and tagged 8, black glutinous rice dessert, bubur pulut hitam, coconut milk, 黑糯米, GUAI SHU SHU, Guaishushu, malaysia, postaday, singapore chinese dessert. Bookmark the permalink.